My friends and I meandered along the trail that ran beside the broken-down remains of a Buddhist temple. It was a school holiday, so we were free from our teaching duties for the day. To get to know the area a little better, we had decided to explore the Angkor Wat complex here in Siem Reap, Cambodia. We finally reached our real destination at this particular temple site: a large lake with trees and birds and bushes. It was such a peaceful sight! However, we were not alone. Two little local girls, laden with trays full of postcards, bracelets, fans and magnets, came to us with pleading eyes and simple English. "Do you want to buy this? This one—one dollar!" Those sad eyes looked awfully convincing, but we knew that it wasn't for themselves that they were trying to sell. Most likely a parent or some other boss was using these young children to sell items to foreign tourists. Not wanting to support unfair child labor, we tried to ignore the pitiful voices and instead enjoy the scenery. The little girls had nearly given up when I sat down on the steps next to them. I used my limited Khmer vocabulary to strike up a conversation. "What is your name? How old are you?" I asked. Their eyes brightened and they told me. "What is the name of that mountain over there?" They informed me, then once again asked if I wanted to buy a fan or postcard. I smiled and politely refused, but kept talking with them. Another little salesperson soon joined us, and the original two excitedly told her that I spoke Khmer. I told them that I was a teacher here, and they asked me many other questions. Our small group grew one by one since there were not many other tourists in that area. The rest of my friends had stretched out for an afternoon nap, but I kept talking with the little girls. We chatted about family and school and their job, and many other things. A couple of the girls spoke a bit of English, so it was great fun to use what words we knew of each other's language to find out more about each other. At one point, they even offered me one of their fans just to use during our conversation - no charge! Soon one of my friends woke up, and I asked if he had any of his Khmer tracts with him. He gave me his very last one, and I asked one of the older girls if she could read it. She read the whole thing out loud, and all of the other little girls listened intently. It was so special to watch! When she finished, I asked, "Do you understand?" She said she did, and I let her keep the tract. When the rest of our group woke up, we decided to teach them a couple of Khmer songs about Jesus. They listened carefully and then sang along. Soon it was time to go, and there were several pictures and hugs together before I waved a final goodbye. What an exciting appointment from Heaven! There are so many people here who have no idea who Jesus is. 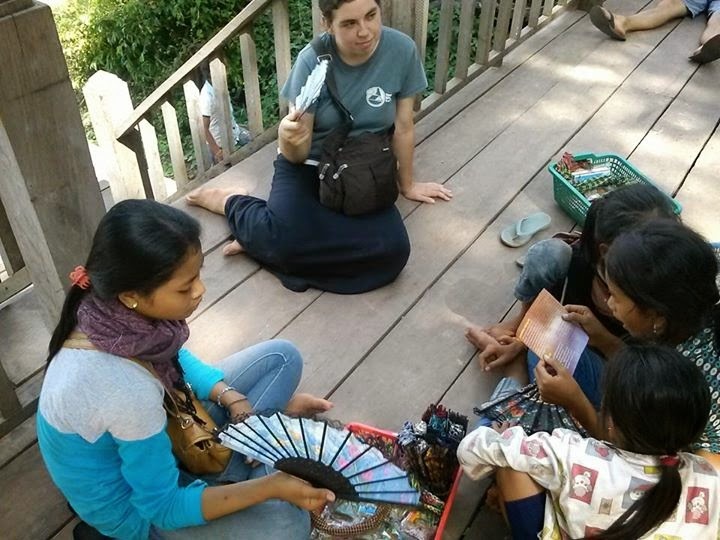 But even though I'm not out at Angkor Wat every day to meet kids and teach them about my God, I do have chances during every normal school class period that I teach, to disciple my own students in how to do this themselves. Then one day, they can be missionaries themselves! Pray for the work in Cambodia, that God will let these simple lights shine for Him. Maybe one day you'll join us over here!